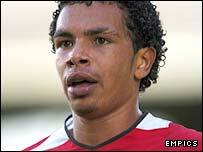 Manchester United's Kieran Richardson has celebrated his 21st birthday by signing a four-year deal which will keep him at the club until June 2009. The winger, who has won four England caps, returned to Old Trafford this season after a successful loan at West Bromwich Albion last season. "I am happy to commit my future to Manchester United," Richardson told the club's official website. "It's the club where I want to be and I couldn't imagine being anywhere else." Richardson's performances for West Brom last season earned him a surprise England call-up for the summer tour of the United States. He scored twice on his debut against the US and despite the offer of another loan spell at the Hawthorns, the winger opted to stay at United and fight for a place in the first team. He has made eight appearances this season, mostly at left-back in place of the injured Gabriel Heinze.